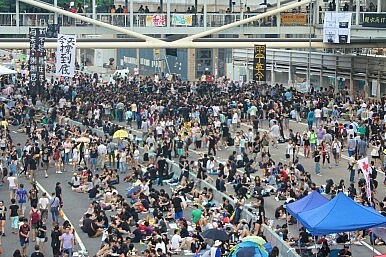 The Chinese Communist Party’s official newspaper claims the U.S. is trying to foment a “color revolution” in Hong Kong. A commentary in the official newspaper of the Chinese Communist Party on Saturday accused the U.S. of trying to foment a “color revolution” in Hong Kong. However, the National Democratic Institute (NDI), a subsidiary of the NED, does maintain a tiny office in Hong Kong. The Diplomat has learned that NDI’s Hong Kong office typically employs one international staff member and occasionally hires one or two locals to help out when needed. Most of NDI’s work in Hong Kong focuses on holding workshops attended by young leaders from all interested political parties that focus on building skills in areas like public speaking, campaign strategy, message development and message delivery. The Diplomat has learned that NDI has regularly worked with pro-Beijing political parties in Hong Kong who, like all political parties, hope to prevail in local elections. Local Hong Kong press have occasionally accused NDI of being a front for the Central Intelligence Agency (CIA) in the past. Beyond NED, the People’s Daily article notes that three former U.S. Consuls General to Hong Kong had “recently united” to write an open letter to Hong Kong Chief Executive CY Leung. Most of the People’s Daily’s claim that the U.S. is trying to foment a color revolution in Hong Kong, however, is based on mainstream newspapers using the term “Umbrella Revolution” in their coverage of the Hong Kong protests. For example, it notes that the Associated Press and Wall Street Journal had used the term “Umbrella Revolution” in their Hong Kong coverage. Neither organization is affiliated with the U.S. government.